All Products > "58391 Tamiya 1/10 Hotshot 4WD 2007"
The instantly recognisable Hotshot, the buggy which started off the 4WD craze, was re-relased by Tamiya in 2007, 22 years after being unveiled to the R/C world for the first time. 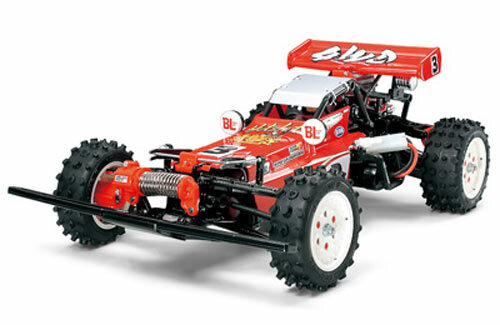 Back In 1985 it was regarded as the pinnacle of performance and despite being quickly outclassed by offerings from Kyosho in the form of the Optima, this model still inspires the heart of all R/C fans. An upgraded version of the original, you don't need to rely on nostalgia alone to enjoy this model; thanks to the 4WD, dual shock set-up and simple suspension, it will take a reasonable level of abuse and still keep on going. A delight to built, (although not advised for the novice modeller) it contains a driver figure and mesh window netting along with a hatch to check on your ESC and radio gear which are designed to be installed in an enclosed tray, helping to keep away dust, dirt and water. Such a brilliant model doesn't deserve to hang about on the shop shelves - see for yourself just what makes this model stand out from the crowd!